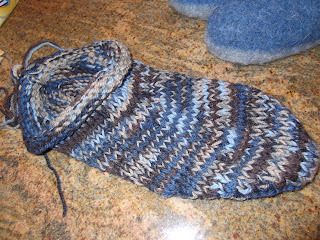 I'm working on another pair of clogs - using multi-colored yarn this time. I'm planning to use U-glue from Joann's and glue this pair to some hard soles. 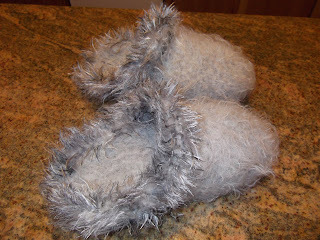 I think I'll use flip-flop soles since I haven't been able to find any inexpensive crocs. This pair of blue clogs was made using the unchanged **original pattern - it lets the heel area rise a little higher and I think gives the clogs a "mukluk" shape. I wore this pair last night while playing Scrabble with some friends, letting my feet do the final drying of the sole, since they were felted just the night before - they were so comfortable I forgot I was wearing them and the soles were completely dry by evening's end. I'm calling this pair "Possums". The cuff was purled with a strand of novelty yarn and the main part of the clogs were knitted with the kind of yarn used for fisherman's sweaters. 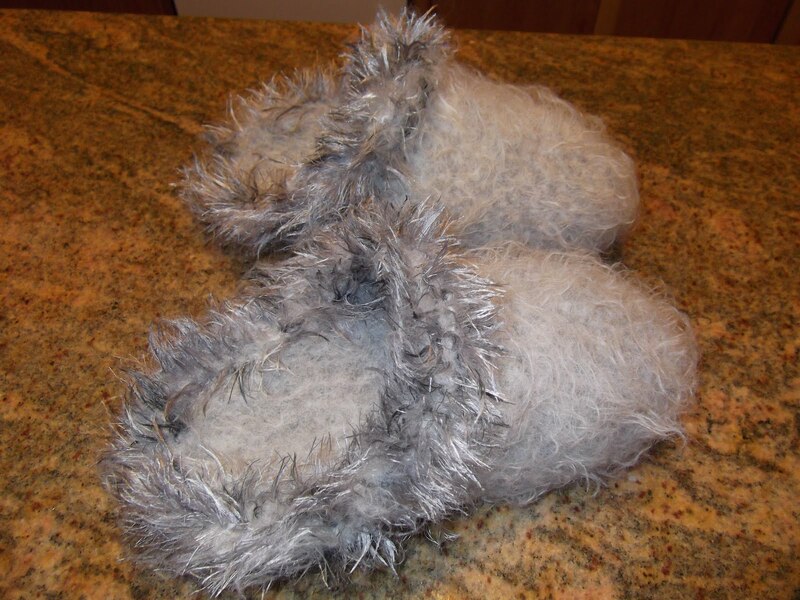 It became a little fuzzier than the Paton's yarn used for the other clogs. **There is a change that keeps the heel lower, making it easier to slide a foot into the clog. This change is especially appropriate if the clogs are going to be glued to a hard sole - with the unchanged pattern, it's best if the sole is flexible while working the foot into it. The change is at row 33. Replace pattern row 33 with this row: slip1, K12(10,11/12,13), K2tog., K1, ssk, K12(10,11/12,13), ssk, K2tog., K to end of row. Do not turn and skip all other pattern rows to cuff. Do not knit second sole, E-Glue to croc or other sole and clamp down all around. smiling....love the "possums" clogs name! Love the clogs and the colours. I am wondering if you can post the pattern? Do you knit them on circular needles? 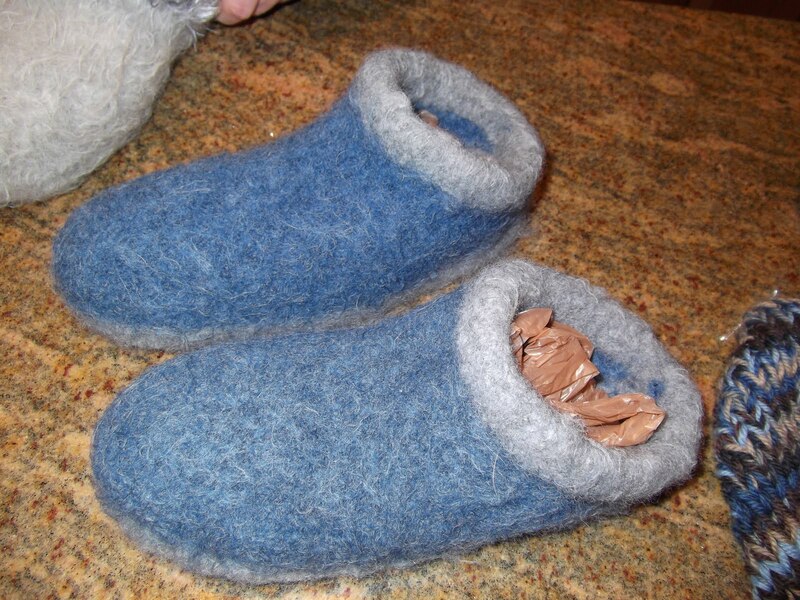 Yes, the clogs are knitted on circular needles - two sets. I found an inexpensive pair of clogs at my local pharmacy. They were also at K-Mart and WallyWord but CVS pharmacy had them for less. Like most pharmacies, it is branching out and carrying grocery items as well as small appliances. Mine have held up pretty well. I used to wear them to feed in the a.m. Now I use them when I go to the backyard and water plants. They have held up well for at least five years. PS. Although my mother knits, she said these were not in her capabilities. At 87, she has a depth persception problem and is slightly blind in the other one. Thanks for the information on the clogs. I did find a free pattern at knittingatnoon website. But I am not an experienced knitter so I am getting help from some knitters in my hooking group! Stay warm and safe, spring can't be far away now!